You know as well as I do that the clock doesn’t stop when you’re a female entrepreneur. Not even when you go on vacation. That doesn’t mean you can’t not go on vacation though. 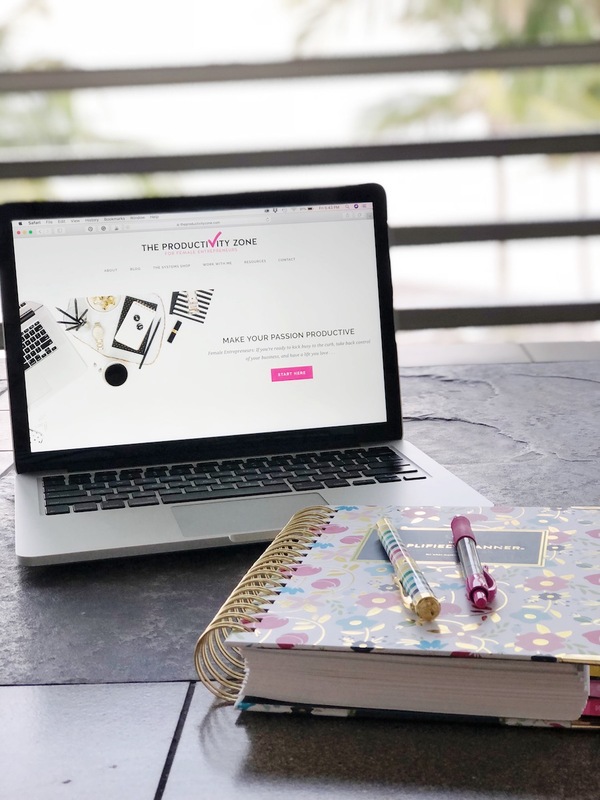 But, if you are anything like me (a female entrepreneur who is also a solopreneur), you know that there are still a few things you have to do while you’re on vacation. But you also don’t want to be hunkered down behind your laptop for all of your vacation—because hello, palm trees—riiiiiight?! That’s where a stress-free vacation workflow comes in!! I’ve been practicing what I like to call a stress-free vacation workflow for 3 years now, and I think I’ve pretty much perfected it. I shared about it on my Instagram Stories while on vacation last year and got quite a few questions about it and requests to share more!! So today, I’m doing just that. The KEY to a successful vacation workflow is keeping things completely stress-free, which means setting and sticking to BOUNDARIES. Got it? Get it? Good!! 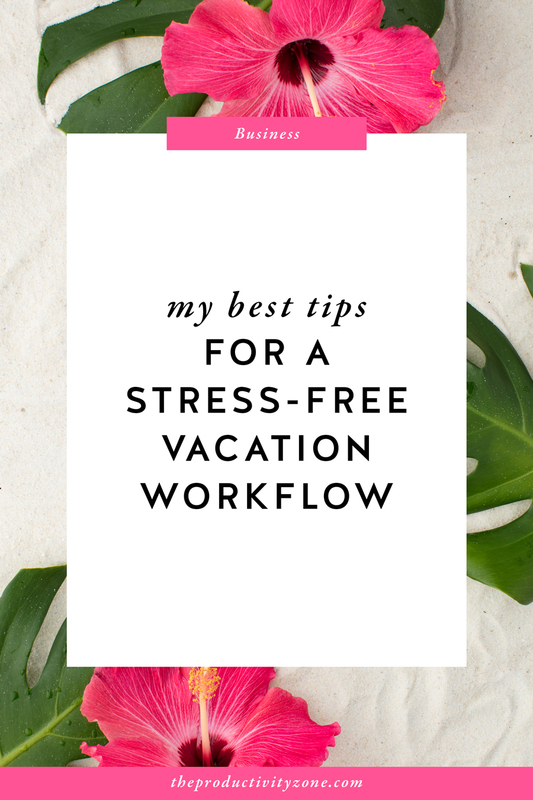 Now, here we go: my best tips for a stress-free vacation workflow!! Related Post: Have You Set Business Boundaries? Why You Need to Be! You should have absolutely no due dates or deadlines while you’re on vacation (and zero looming over you right when you get back). Get everything that has a set-in-stone date on it completed before you leave so you can feel completely at ease and stress-free. Prioritize the most important tasks and projects (aka due now, next, or first) and push back anything that can be completed at a later date. Remember: it’s not about getting everything done, it’s about getting the most important things done. Hard Boundary: No due dates or deadlines while you’re on vacation. Along with no due dates and deadlines, you should not schedule any meetings or calls with clients or business besties. Say it with me: You are on vacation. Meetings and calls of any kind can wait until you’re back in the office. Hard Boundary: No calls or meetings while you’re on vacation. Understand that your vacation is a chance to give your brain and your body a break. You are working in your business all day, every day, and probably thinking about it twice as much. Vacation is a time to remove yourself from all of that so that you can come back refreshed, inspired, and ready to work. If you devour business books normally, it’s probably time to stick your nose in a mind-bending fantasy or trashy romance book. I actually decided not to read any business books while on vacation this year. Instead, I have 6 fluffy romance books queued up and ready to read on my iPad. I also brought along my hard copy of Emily Ley’s Grace, Not Perfection book to give it a second read. Hard Boundary: Don’t just read business books. If you’re only gone for a weekend/long weekend, I would strongly encourage you to leave your laptop at home. Hard Boundary: Step away from the laptop for a few days. Now, friends, this is KEY to the stress-free vacation workflow. You MUST keep it to just an hour or two each day. The reason why is because you don’t want to take too much time away from your vacay!! But it is just enough time to get a few things done to ensure you bypass the dreaded overwhelm when you get home. Hard Boundary: Keep the work you do each day to a minimum (an hour or two at most). 10 minutes for checking that scheduled things are going out or live. Make sure each of your social media platforms have posts going out, that your scheduled blog posts have gone out, and your newsletters have been sent. If something is wrong, fix it, and then move on!! 10 minutes for replying to comments. It’s important (especially for the Instagram algorithm) that you’re still actively engaging with your audience. Take 10 minutes to quickly respond to comments on your posts and also comment on other people’s posts. Disclaimer: This daily 30-minute check-in used to take me an hour. It takes a little bit of practice and a whole lot of intentionality (including setting up simple systems that work long before you even get on the plane), but I promise it’s doable. You’ll get there, just keep at it!! Hard Boundary: Check in with your biz for only 30 minutes each day. PICK ONE THING YOU NEED TO WORK ON . . . This tip is one you can totally skip, but I’ve actually very much enjoyed picking a small project to work on while I’m on vacation. Not a big project, a manageable one that doesn’t require you to bring along a lot of extraneous stuff. Last year, I planned and outlined the next 6 months of blog posts. This year, because I struggled with a severe case of writer’s block before we left, I decided to work on upcoming blog posts every day of vacation so that I could keep my mojo up. 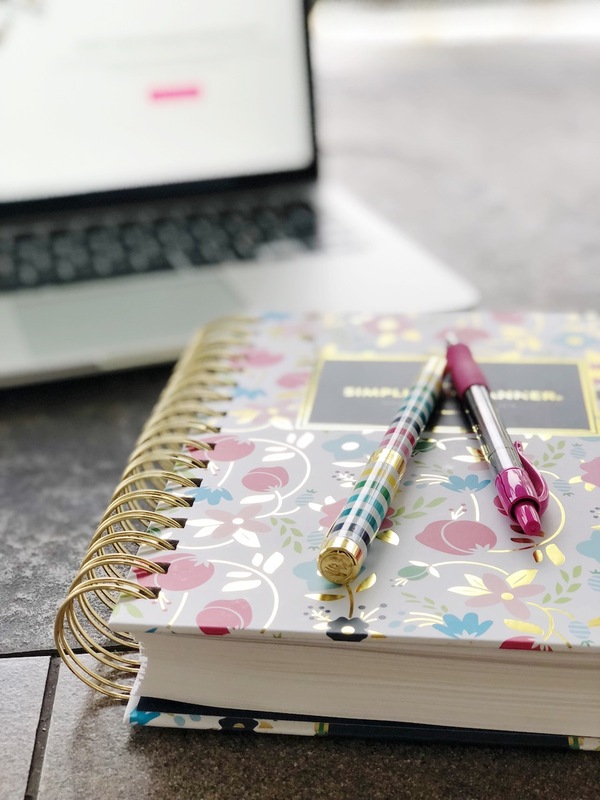 You could also start or finish a course that you purchased, outline a new product or service, fill up your Tailwind queue, create graphic templates, set up some Trello boards, etc. This tip you can also choose to skip, but again, I really enjoy knocking out small projects while I’m on vacation. There’s just something about it being the only thing you have to do/want to do that makes it all the more enjoyable. I chose to start (and finish) Jenna Kutcher’s Instagram Lab last year and thoroughly enjoyed going through a module a day while sitting on the porch. I chose to do the same thing this year with XO Sarah’s Dare to Grow course. You’re probably wondering where the hard boundary was for the last two tips… well, this is it!! Under no circumstance are you allowed to give up or put off any vacation activities for work. If someone says let’s go to the beach or pool, you put on your sunblock and swimsuit!! If you feel like finishing your book, find a place to stretch out and start reading!! If you feel like taking a nap, get snoozing, girl!! Enjoying your vacation is priority numero uno!! Hard Boundary: Do NOT give up or put off any vacation activities so you can work. I actually like to do my vacation workflow late in the evening or during the hottest part of the day because I am from the North and not used to the heat, y’all!! Hard Boundary: No crazy work hours. I don’t stick to any kind of schedule when I’m on vacation and I never ever plan out my vacation days like I do my workdays. And neither should you!! 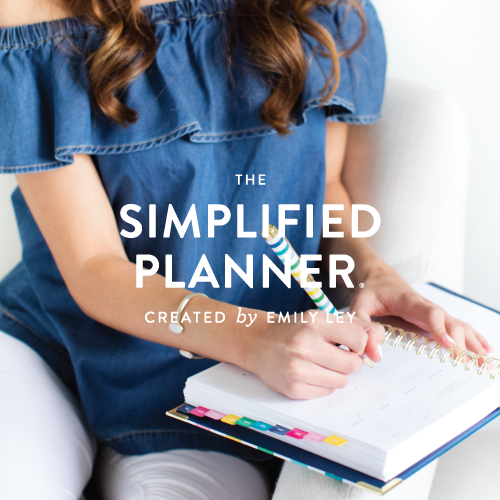 Even though I bring my Simplified Planner with me on vacation, I only make a loose plan of what I want to get done each day. It doesn’t really matter to me when, and if it doesn’t get done, oh well!! 🤷🏼‍♀️ I’m on vacation!! My best advice is to make plans, but live in the moment when you’re on vacation!! Hard Boundary: Schedules are for workdays, not vacation days. This tip might be obvious, but I still think it’s worth mentioning… do your work as comfortably as possible. That means comfy clothes, comfy chair, yummy snacks (I discovered GF edible cookie dough on this trip), out on the porch where it’s sunny and warm, inside where it’s cool, at a table overlooking the pool, or at a coffee shop with an iced coffee in your hand. Wherever you feel most comfortable, do your work there. Hard Boundary: When you’re working, be as comfy as possible. As far as I’m concerned, this tip is THE MOST IMPORTANT to the stress-free vacation workflow… do your work with a view!! I always, always (unless it’s raining) do my work on the screened-in porch that overlooks the ocean. If I’m doing work later in the evening, I sit on the bed by the window so I can watch the sun go down. In my opinion, it’s the only way to get work done when you’re on vacation. Hard Boundary: Do your work with a fantastic view. This might be the hardest tip of all. But as female entrepreneurs, we rarely let ourselves just do nothing, and when we do… we feel guilty almost instantly. Try your hardest to let go of that guilt. Let go of the need to always be doing something or thinking about something related to your business. Give yourself some grace, let go of the guilt, and embrace the white space. Hard Boundary: Do NOT feel guilty when you’re not working. Another hard one because we all seem to be attached to our phones these days. But instead of having your phone in your face for your entire vacation, put it down, and look up. You don’t have to like or share everything you experience. For a change, just experience it. Hard Boundary: Put away your phone and actually be present on your vacation. That’s it, guys!! 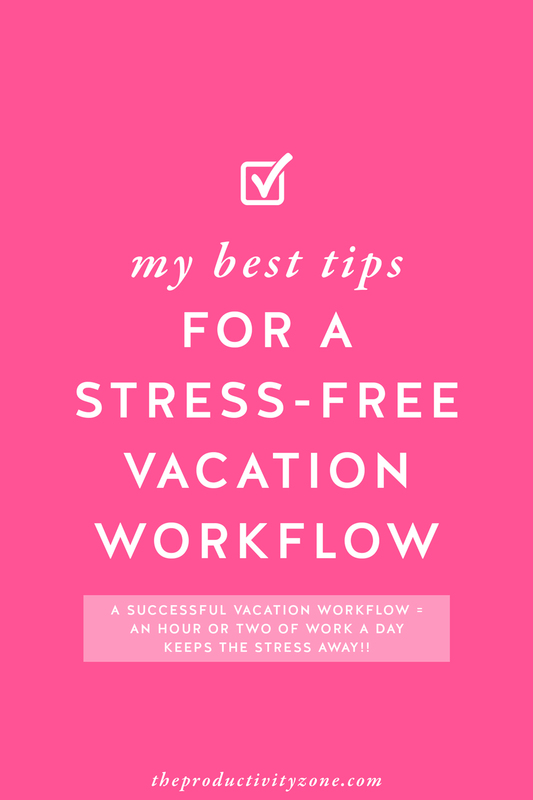 My best tips for a stress-free vacation workflow!! Pretty simple, right? In my mind, working on vacation shouldn’t be complicated or stressful. It should be simple and effective. I hope you’ll be able to use these tips the next time you go on vacation!! Please come back and tell me how it goes! !